This lovely apartment community is ideally situated with easy accessibility to shopping, dining and entertainment. The value you want and the service you expect. Morgan’s Landing invites you to come join a community that blends the convenience of city living with a tranquil atmosphere. Enjoy the beautiful landscaped grounds, sparkling pool or just relax in the courtyard area with your favorite book under one of several large trees. When you arrive home, you will find a community small enough to give you personal attention and large enough to provide the amenities you expect in a cosmopolitan setting. 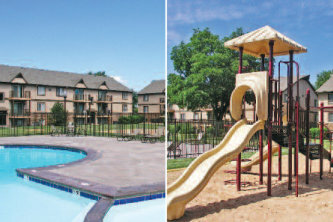 Located just minutes from I-235, Inter Continent Airport, downtown Wichita, Towne West Mall and other major employers. This lovely community is ideally situated with easy accessibility to shopping, dining and entertainment. Your search is over, it’s time for pleasure, relaxation and comfort to begin. Studio - 508 sq. ft.
1 bedroom - 680 sq. ft.
2 bedroom - 900 sq. ft.